The December 2014 meeting of the ITE Manitoba Section will be held on Thursday, December 11th starting at 12 noon at the Round Table Steak House and Pub located at 800 Pembina Highway. Presenting this month is David Wiebe, P.Eng. PTOE. David is a partner at Dillon with over 13 years of experience on transportation infrastructure projects, including project management, specification, detailed design and contract administration. He also works in the field of transportation planning, having led traffic studies, signalization studies and network planning. David is a Professional Traffic Operations Engineer, demonstrating proficiency in all aspects of transportation operations. His interest in alternative modes of travel is evident in his experience with transit, active transportation and sustainability guidelines, such as LEED. For the WWARP project, David was the project co-ordinator for WWARP Part III, and also the Contract Administrator for two of the four construction contracts. David’s presentation is entitled “Waverley West Arterial Roads Project (WWARP) – from Paper to Pavement”. The City of Winnipeg has recently constructed new arterial roads and improvements in the Waverley West area. Essentially completed as of October 2014, the Waverley West Arterial Roads Project extended Kenaston Boulevard from Bishop Grandin Boulevard to the Perimeter Highway (PTH 100) and serves as the principal route for traffic in southwest Winnipeg. In September of 2009, the Federal and Provincial governments announced funding of the Waverley West Arterial Roads Project (WWARP). Design commenced, and construction on what became known as WWARP Part I at the Kenaston Boulevard and Bishop Grandin Boulevard intersection. By the fall of 2014 over 40 lane-kilometers of new roadway were constructed and opened to the public. A grade separated interchange and kilometres of new active transportation pathways were also constructed and connected to the neighbouring communities. This presentation will provide an overview of the project from a concept in the City’s Transportation Master Plan through to ultimate construction and opening. Along the way were challenges ranging from funding, stakeholders with competing timeframes, and unique design features. Following the presentation, there will be a short Annual General Meeting for members, including a review of the 2014 financials, a proposed budget for 2015, and election of the 2015-2016 executive (officers). Please note that the price of the luncheon is $20.00 for members and friends and $15.00 for students. Cash fees will be collected at the luncheon. The November 2014 meeting of the ITE Manitoba Section will be held on Thursday, November 20th starting at 12 noon at the Round Table Steak House and Pub located at 800 Pembina Highway. Presenting this month is Jenny Chaverri, MSc Eng, PhD Candidate. Jenny is a Civil Engineer who is currently a PhD Candidate and research assistant at the Transport Information Group from the Department of Civil Engineering at the University of Manitoba. In 2005 she received her Masters in Science Engineering from the University of New Brunswick, Canada focused in pavements and transportation asset management systems. She received her bachelor’s degree in 2000 at the University of Costa Rica. Throughout 2000 – 2013, Jenny worked at the University of Costa Rica at the National Laboratory of Testing Materials and Structural Models (Lanamme). Between 2006 – 2013 Jenny held two positions, as a professor in the Department of Civil Engineering and as the Head of the Technical Audit for the National Road Network of Costa Rica. This program audits the contracts executed by the government of Costa Rica from a civil engineering perspective. She has experience in transportation asset management systems, pavement structural design, and road safety. She has worked as an international consultant in Mexico, Guatemala, Honduras, El Salvador, Nicaragua, Costa Rica, and Panama. Jenny’s presentation is entitled “Integrating Road Safety in an International Transportation Corridor Investment Plan”. In 2002 eight countries (Mexico, Belize, Guatemala, El Salvador, Honduras, Nicaragua, Costa Rica, and Panama) signed an international agreement to define standards for their international road network. In 2010 these countries launched, in partnership with the Inter-American Development Bank (IADB), the development of an investment plan for the International Corridor of Mesoamerica at the Pacific side. This corridor has an extension of 3,244 km traveling from Puebla – Mexico to Panama City – Panama. This presentation highlights an example of international strategies to incorporate the Road Safety Component into the planning stage in road infrastructure in accordance with the Road Safety Decade of Action from the United Nations. Russell Brownlee, B.Sc., M.A.Sc., FITE, P.Eng. 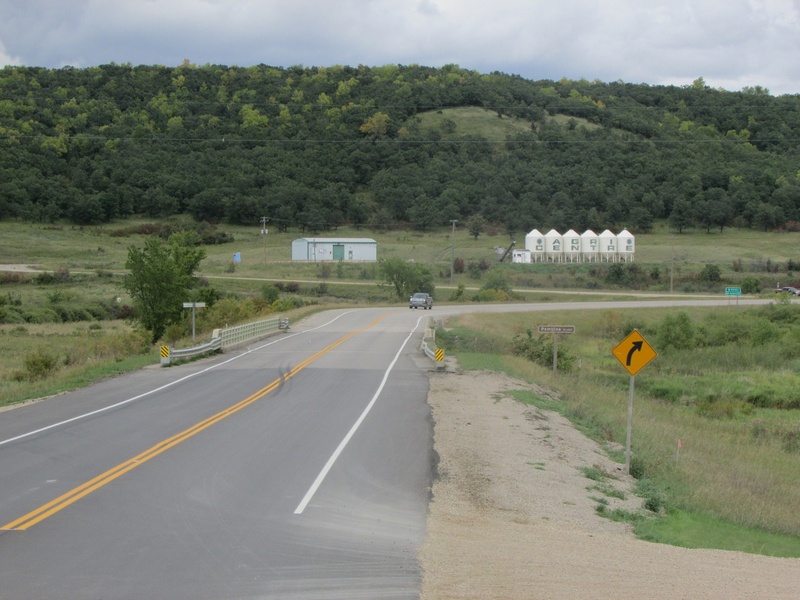 The Institute of Transportation Engineers (ITE) Manitoba Section and Technical Liaison Committee of CITE are pleased to provide a unique professional development opportunity for those who operate, maintain and consult to agencies with rural road facilities. It is estimated that two-thirds of all fatal collisions occur on our higher speed roads in rural areas and within smaller urban areas in Canada. The workshop content is based on the state of the practice in rural road safety in North America and provides proven countermeasures and numerous cases studies related to the dominant collision types experienced within these operating conditions. This course would be of benefit for staff and consultants involved in roadway operations and maintenance in rural areas and/or smaller communities. Please click here for details on this event! To register for the event, please go to our Eventbrite page. The October 2014 meeting of the ITE Manitoba Section will be held on Thursday, October 23rd starting at 12 noon at the Round Table Steak House and Pub located at 800 Pembina Highway. Presenting this month is Lance Vigfusson, P.Eng. C.I.M. – Assistant Deputy Minister of Engineering & Operations with Manitoba Infrastructure and Transportation. His responsibilities include management of the department’s five regions, which look after the construction and maintenance of the provincial highway network. He is also responsible for ensuring the safe operation of the provincial winter roads system, which provides seasonal access to land-locked remote communities. As well, his responsibilities include the maintenance and operation of the 24 provincially owned remote airports, and a fleet of eight marine vessels providing service to communities in Northern Manitoba. After graduating from the University of Manitoba with a Bachelor of Science in Civil Engineering, Lance worked the first 8 years of his career in the engineering consulting business. He joined the Department of Transportation in 1987, and since then has had a progressively responsible career looking after the design, construction, and maintenance of highways throughout the Province. In 1998, he moved into a Head Office role as the Executive Director of Construction & Maintenance. In 2006, he was promoted to the position of Assistant Deputy Minister. In this position, he is responsible for providing the leadership necessary to guide a very large Division (over 1500 employees) with an annual infrastructure and operating budget of approximately $750 million. Lance’s presentation is entitled “Manitoba’s Core Infrastructure Priorities – The Next 5 Years”. This presentation will provide you with insights on Manitoba’s commitment to investing in provincial highways & bridges, flood protection, and other important municipal infrastructure. As Manitoba Infrastructure and Transportation (MIT) will be responsible for delivering 75% of the Core Infrastructure commitment, the focus of this presentation will be on what to expect over the next five years – including highlights of some of the planned, major projects within MIT. ITE Manitoba 5th Annual Golf Tournament! September 22nd at Pine Ridge! 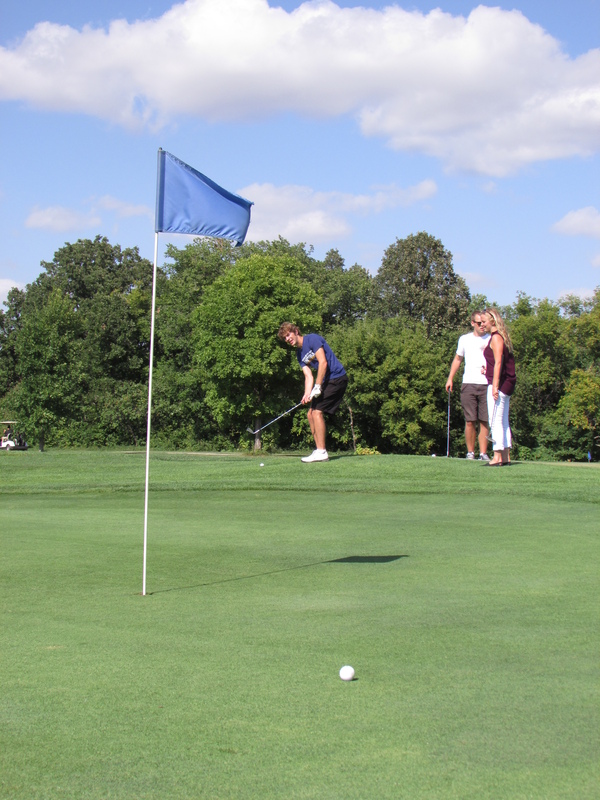 See the 2014 Golf Tournament page for details. Back again for another year. Mosquitos not invited. 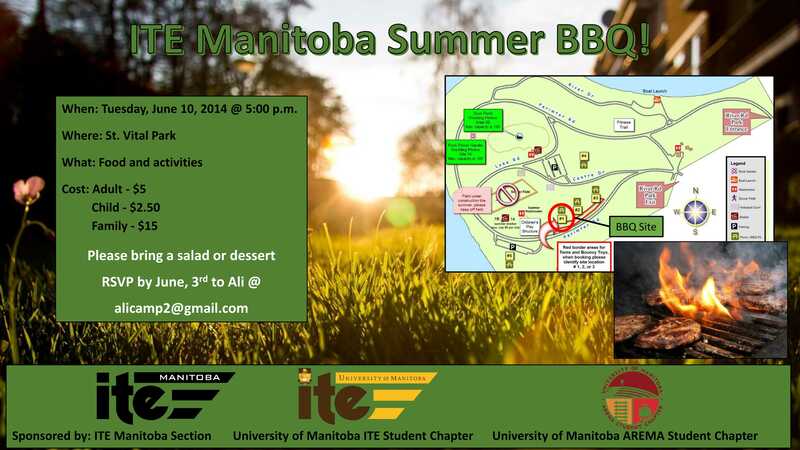 ITE Manitoba is moving outdoors for our final event before the summer break! This is a family friendly event and will be held at St. Vital Park starting at 5 pm. An RSVP is required. More information available by clicking on the invitation below. The May 2014 meeting of the ITE Manitoba Section will be held on Wednesday, May 14th starting at 12 noon at the Round Table Steak House and Pub located at 800 Pembina Highway. Presenting this month is Rebecca Peterniak. the winner of the Kean Lew Memorial Student Paper and Presentation Competition. The prize is awarded for an outstanding student paper/presentation submitted to ITE Manitoba. It is given in memory of Mr. Kean Lew,P. Eng., a graduate of the Civil Engineering program at the University of Manitoba and active member of ITE Manitoba, who tragically lost his life in 2009. The award is generously supported by members of ITE Manitoba. Rebecca is completing a M.Sc. in Civil Engineering at the University of Manitoba. Her thesis research combines her interest for road safety, vulnerable road users, and transportation in developing countries through an evaluation of pedestrian accommodation at signalized intersections on the Pan American Highway in San Jose, Costa Rica. This work involved a three-month internship at Lanamme, Costa Rica’s national transportation laboratory. Rebecca has completed seven work internships in the public, private, and academic sectors of civil engineering throughout her B.Sc. and M.Sc. programs. She chairs the Canadian Road Safety Youth Committee, which is a multidisciplinary group of young professionals working across Canada to generate awareness of youth road safety and build capacity for the profession. Rebecca is a Board Member of the Canadian Association of Road Safety Professionals and a member of TAC’s Road Safety Standing Committee. She has been actively involved in the University of Manitoba ITE Student Chapter since 2009. Rebecca’s presentation is entitled “Evaluating Pedestrian Accessibility at Level Railroad Crossings”. This research identified pedestrian accessibility concerns on at-grade railroad crossings and developed a site assessment tool for practitioners to use to evaluate the accessibility performance of existing crossings. Pedestrian accessibility concerns are design, operational, or maintenance aspects of the transportation system that limit their ability to travel. At an at-grade railroad crossing, accessibility concerns can occur on the approaches, the crossing surface over the tracks, and with the operational devices. Accessibility concerns are most severe over the track infrastructure, where crossing pedestrians may become entrapped and struck by an approaching train because uneven surfaces, limited manoeuvring space, insufficient crossing time, or a lack of visual and audible warnings. This research combined a literature review, jurisdictional survey, and series of site visits in Winnipeg to develop a practical tool to assess the accessibility performance of existing at-grade railroad crossings and identify concerns. Dr. Garreth Rempel, P.Eng., MORR Transportation Consulting Ltd. The April 2014 meeting of the ITE Manitoba Section will be held on Thursday, April 24th starting at 12 noon at the Round Table Steak House and Pub located at 800 Pembina Highway. Presenting this month is Dr. Garreth Rempel, P.Eng., a Principal at MORR Transportation Consulting Ltd. Dr. Rempel is a registered Professional Engineer in Manitoba, Saskatchewan, and Ontario and has been a member of ITE since 2006. He has served ITE at the Student Chapter, Manitoba Section, and Canadian District levels. Dr. Rempel has conducted and led projects on urban goods movement, road safety, truck size and weight policy, greenhouse gas emissions, traffic information systems, pedestrian accommodation, and intermodal freight transportation. He has contributed to several TAC products such as updating the pedestrian walking speed section of the MUTCDC, developing a resource document for truck lanes, and is currently creating a national guideline concerning digital advertising signs and their road safety impacts. Dr. Rempel’s presentation is entitled, “Guiding Principles for Developing Digital and Projected Advertising Display Regulations”. Digital and projected advertising displays (DPADs) are a rapidly emerging form of roadside advertising. The brightness of DPADs and their ability to distract drivers by displaying dynamic content are causing concern about their road safety impacts. Most jurisdictions have sign by-laws designed to control the time, place, and manner of static advertising signs; however, many jurisdictions have not updated their by-laws to address the unique characteristics of DPADs. The objective of DPAD regulations is to control the negative road safety effects of DPADs. This presentation will describe five principles to guide professionals during the development of DPAD regulations from a road safety perspective as part of a larger study to develop national guidelines for the application and use of digital advertising signs. These principles are safety, consistency, specificity, evidence-based, and pragmatism. These principles help ensure that regulations hold public safety as the primary concern, result in DPADs operating in a manner that emulates static advertising signs, pertain only to issues unique to DPADs and not to issues that are common to all advertising signs, are evidence-based, scientifically supported, and sensitive to local conditions, and are pragmatic and enforceable.. The March 2014 meeting of the ITE Manitoba Section will be held on Thursday, March 20th starting at 12 noon at the Round Table Steak House and Pub located at 800 Pembina Highway. Presenting this month is David E. Lettner, BA, MPA, MCIP, a Senior Transportation Planning Consultant with Manitoba Infrastructure and Transportation (MIT). Mr. Lettner holds a Master’s degree in public policy and is a member of the Canadian Institute of Planners. His professional career spans 32 years in both the public and private sector where he has completed over 125 major planning and policy studies in the transportation and land use planning sectors. Mr. Lettner was the Project Manager for the Pembina-Emerson POE study. Co-presenting is Jake M. Kosior, PhD, P. Eng, also a Senior Transportation Planning Consultant with MIT. Dr. Kosior holds an interdisciplinary PhD in engineering and economics and is a professional engineer in Manitoba. His career spans 35 years in the public service, private sector and academia. In 2011, Dr. Kosior received the Transportation Association of Canada (TAC) Award of Excellence in Research and Policy. Dr. Kosior developed the original algorithms for application in both POE forecasting and LOS methodologies. Their presentation is entitled, “Applying Level-of-Service Concepts to Ports-of–Entry Performance Measurement”. Major land-based Port-of-Entries (POE’s) are key surface transportation assets within the global supply chain. Appropriate planning methodologies are essential for assessing whether port infrastructure is adequate to meet projected traffic demand and facilitate economic development..A new POE forecasting technique and an innovative level-of-service (LOS) methodology were developed during the Pembina-Emerson POE Study (2012) by Manitoba Infrastructure and Transportation. Based on concepts in the Highway Capacity Manual, the innovative forecasting techniques and LOS methodology developed by MIT can be used to assess port performance based on any combination of policy settings, processing times, staffing levels or infrastructure improvement scenarios. Combining the LOS methodology (a trade-off analysis) with 30th highest hour design (an infrastructure design approach) provides transportation policy makers, planners and engineers with greater flexibility to assess the implications of various port improvement scenarios, infrastructure designs, phasing considerations and economic benefits to transportation system users. Please note that the price of the luncheon is $20.00 for members and friends and $15.00 for students. Fees will be collected at the luncheon. The February 2014 meeting of the ITE Manitoba Section will be held on Thursday, February 20th starting at 12 noon at the Round Table Steak House and Pub located at 800 Pembina Highway. Our presenter this month is Diana Emerson, P. Eng., MCIP. Diana is a transportation engineer with 17 years of professional experience in transportation engineering and planning. Diana has a Bachelor of Science in Civil Engineering and a Master of City Planning, both from the University of Manitoba. Through past positions with DS Lea Consultants and the City of Winnipeg and her current position as Traffic Services Engineer with Manitoba Infrastructure and Transportation, she has developed a diverse and well-rounded background in transportation including urban transportation planning, regional and neighbourhood traffic management, highway traffic safety and operations, traffic impact studies, pedestrian safety and active transportation. Diana will be presenting on “A Review of Railway Crossing Considerations from a Road Authority’s Perspective”. She will give an overview of at grade crossing stats in Manitoba and on Manitoba’s provincial highway network, review MIT’s approach to handling railway crossing matters and discuss Transport Canada’s draft Canadian Railway – Roadway Grade Crossing Standards with highlights of the draft standards for highway projects.